A series of developments in the region, including the emergence of China and India, the establishment of the East Asia Summit in 2005, and the evolution of regional institutions such as Asia Pacific Economic Cooperation (APEC) and the ASEAN Regional Forum (ARF) have made it necessary to redefine the strategic value of Japan-ASEAN cooperation. With the adoption of the 2011 Joint Declaration for Enhancing ASEAN-Japan Strategic Partnership and the ASEAN-Japan Plan of Action (2011–2015), ASEAN and Japan are in the position to build a strategic partnership to benefit not only ASEAN and Japan but also the wider international community in the longer term. This book, prepared for the Japan-ASEAN Ministerial Meetings, proposes ways in which strategic partnership between ASEAN and Japan can both contribute to a more stable and prosperous East Asia and help support more effective global governance. CSIS Jakarta and JCIE have released a publication that charts a way for Japan and the ASEAN member countries to strengthen their ties. Produced by a multinational study team, this book outlines the ways that Japan can help promote deeper integration within ASEAN, and how ASEAN and Japan can build a strategic partnership that can benefit not only themselves, but also the wider international community. 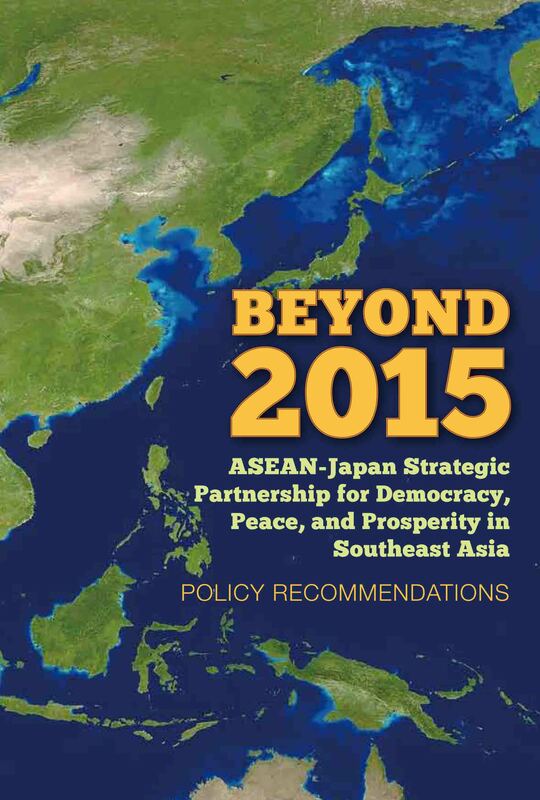 The same team also released policy recommendations for leaders attending the October 2013 ASEAN-Japan Summit. Against this backdrop, the Ministry of Foreign Affairs of Indonesia (Director-General for ASEAN Cooperation), as the proponent of a project on ASEAN-Japan Strategic Partnership funded for two years by the Japan-ASEAN Integration Fund (JAIF), requested the Centre for Strategic and International Studies (CSIS) Jakarta and the Japan Center for International Exchange (JCIE) to compile policy recommendations on the ASEAN-Japan Strategic Partnership beyond 2015. In response, they launched a project to study the role and contributions of ASEAN-Japan Partnership in promoting regional community building in Southeast Asia and East Asia, as well as in contributing to global governance. This project aims to further encourage efforts to achieve greater ASEAN integration with an eye toward 2015, as well as identify a vision for the ASEAN-Japan relationship in 2015–2030. In its first year, the project explored the framework of Japan-ASEAN partnership in ASEAN and Japan’s role in promoting the integration of ASEAN and Japan. The study was carried out by three study groups consisting of several dozen experts from Japan and ASEAN countries. These were coordinated by Rizal Sukma (Executive Director, CSIS Jakarta) and Yoshihide Soeya (Professor, Keio University). The recommendations were submitted to the ASEAN secretariat and the foreign ministries of Japan and the ASEAN member nations in advance of the October 2013 ASEAN Summit and the ASEAN-Japan Special Summit, and were subsequently published as a book. In the second year, two study groups focused on the ways in which Japan-ASEAN cooperation can contribute to the creation of an East Asian community, while at the same time helping to address global issues and improve global governance. Those recommendations are being submitted once again to the ASEAN secretariat and the relevant foreign ministries in advance of the 2014 ASEAN Summit and the ASEAN-Japan Special Summit, and the papers will be published as a book in Winter 2014.